Recent ITIL certification stats published by EXIN that originate from APMG show clearly that over quarter of a million ITIL certifications are issued every year (extrapolating the 9 months of stats). 200,000 of them are V2 and V3 Foundations. V3 Foundations outnumber V2 Foundations by about 6:1. So every year we certify another 200k ITILers. Think about it: three years of V3 certs, plus a decade of V2 certs. There was a rumour a while ago on twitter that we'd passed the million. I have no doubt it was true. As Mythbusters would say: "plausible"
Thats 250k x $200 = $50M in certification fees per annum. That's not a huge number as industries go, and a few folk clip that ticket, but it's a nice little earner nevertheless. Next story: Do you promise not to tell? Submitted by aroos on Thu, 2010-12-02 11:47. According to my data as of September there are roughly 1.35 million Foundation exams taken. This includes fairly reliable EXIN and APMG numbers and an estimate of ISEB exams at 200.000 ITIL Foundations. Then we must consider the pass rate too. If it has been 85%, the millionth certificate was issued probably last February. Submitted by deaf-llama on Thu, 2010-09-09 19:52. How many ITIL lecturers does it take? Good to hear that 200,000 people gain an ITIL Foundation Certificate every year. It probably is true over 1 million hold ITIL certificates as the numbers grew dramatically between the launch of ITIL V2 in 2000/1 and the levelling out in 2006/7 ready for the launch of V3 in May 2007. Assume an average course size of 12, then that's about 17,000 courses. Assume all 52 weeks of the year get used for training then that is 320 courses per week. It is not really possible for one lecturer to teach two 3 day courses in a week (although this is done for some onsite courses and a few vendors do run 2 day courses where 2 per week is possible). Therefore, the world needs about 300 ITIL Lecturers who don't teach anything but ITIL Foundation. One UK company, probably, has 10% of the World market for ITIL Foundation since I hear it employs over 30 dedicated ITIL trainers. The other interesting fact from the APMG statistics is that the no. of certificates gained for ITIL Intermediate is significantly higher than the sum of ITIL (V2) Practitioner + ITIL (V2) Manager. 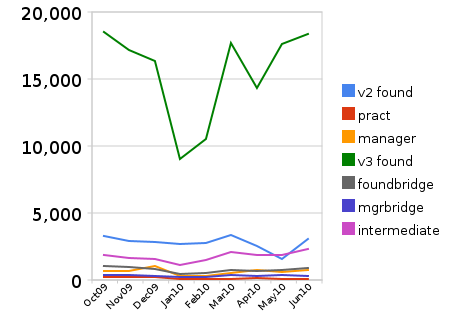 It would be good to see the ITIL V2 Practitioner + ITIL V2 Manager numbers back in 2006/7 before V3. Then we would really be able to answer the question whether ITIL certification takeup (outside of Foundation) is growing, static or declining. I find it quite amazing that each week 320 x 12 = 3840 people are sitting in an ITIL Foundation classroom. Submitted by skeptic on Thu, 2010-09-09 20:04. "3840 people are sitting in an ITIL Foundation classroom". Not they're not. The majority(?) of them are pumped through online training, or - like me - no training at all. These stats are for certification not training - a subtle distinction. Submitted by deaf-llama on Thu, 2010-09-09 20:26. They used to show paper-based and online exam results separately. Why don't they do that? Personally, I'm not convinced online training has taken off, but I'm fully prepared to believe that "No training and exam only" has. Submitted by Tom Rankin (not verified) on Mon, 2010-09-13 05:12. I think that online training for foundation certification is alive and well. We are making it available to our 500+ IT staff. Is it the best method to learn? Maybe not for everyone. Is it the most cost effective way to get people Foundation Certified? You betcha. The stuff we purchased is about as entertaining as ITIL training can be. Is ITIL Foundation enough to make that much of a difference to what people do and why the do it? No way. 30 minute workshops (lots and lots of them) aimed at listening to what people do/want/need, letting them vent, gather ideas on how Mgt can remove obstacles. Good for getting some cross-functional empathy happening. 180 minute Toolset CBT - how to navigate the tool. 45-180 minute face to face toolset training across processes we are using. ITIL Foundation Pocket guides for all. Plenty of process/procedure doco online and embedded in tools. Embedding processes & procedures as agenda items in existing exec/team/customer meetings. Incl goals and WIIFM at various levels. Embedding some "ITSM measures" in team & performance plans. itSMFA membership for anyone who is going to use it. Including some spots at the conference to do some networking and learn some new stuff. Regular newsletters, town halls. an internal social network. FAQs, hot tips, our CEO hosts lunches with staff regularly and has run the first of hopefully many online discussion Q&As. A "mascot" for ITSM whereby people can identify anything ITSM. They can get the mascot photographed in interesting places (at the zoo, football, etc) and have it published on our intranet. The Foundation certification gives some people a bit of the lingo. But not that much else. The above is good, but there's never too much comms and training. Of course our toughest challenge is to sustain the energy and momentum.............. forever. Submitted by guerino1 on Thu, 2010-09-09 16:04. How's the ITIL Training and Certification Business in Your Area? I'm curious... How is the ITIL training and certification business (for those of you that provide such services) in your area of the world? Most of our experiences are in the Northeast United States, in NY metro, although we have been getting consistent messages from colleagues and peers in other areas of the US, England, Italy and Spain. We're seeing that fewer and fewer leaders are pushing ITIL and that fewer and fewer IT resources are looking to be certified in it. (I'm not trying to speak for the entire industry or make assumptions or reflection about ITIL. This is just what we've been seeing and hearing from our own colleagues.) Is this true or false for you and your area of the world? These perceptions seem to be consistent with Gartner's statement on ITIL growth slowing. We don't know if this is coincidental or not. Are you seeing the same or otherwise?